The weather Gods smiled at us and a widow opened up that would allow us to run 240 miles in relatively good weather and seas. The forecast was 4-6 ft @ 10 seconds, improving north of the Columbia River Bar. We left Newport at day break and slack water over the bar. We met a USCG boat towing a fishing boat at the mouth of the harbor. After a small delay to let the tow clear the bar we were on our way. Our timing across the Columbia River was just at sunset and the river was ebbing. Even 18 miles offshore the current slowed our progress to just 6 kts. As we crossed north of the river speed increased to almost 9 kts evening out the lost time south of the river. Seas were on the beam, 6' at 10-12 seconds with the occasional larger wave coming thru. Things settled down the further north we got and by the time the sun came up 3-5' seas with light winds were a welcome relief. The harbor is on the Makai Indian reservation. The small village is an active tourist destination focused on fishing. Evidence of the tribe being on this isolated point for 3,800 years is displayed in a very well done museum confirming they are indeed a hearty people. Archaeological research suggests that the Makah people have inhabited the area now known as Neah Bay for more than 3,800 years. The ancient Makah lived in villages, inhabiting large longhouses made from western red cedar. These longhouses had cedar-plank walls. The planks could be tilted or removed to provide ventilation or light. The cedar tree was of great value to the Makah, who utilized its bark to make clothing and hats. Cedar roots were used in basket making, while canoes were carved from whole trees to hunt seals, gray whales and humpback whales. The Makah acquired much of their food from the ocean. Their diet consisted of whale, seal, fish, and a wide variety of shellfish. They would also hunt deer, elk, and bear from the surrounding forests. Much of what is known about the way of life of the ancient Makah is derived from their oral tradition. There is also an abundance of archeological evidence of how the Makah lived. Along the roadway are a number of signs condemning the use of drugs and the importance of honoring elders. The best looking building we saw was a senior citizens support facility. Along the road, just off the sidewalk was perhaps, the smallest library in the world. The titles were current and included a book Mary is reading off the New York Times Best Seller List. Our first anchoring event in the PNW was rewarded with a crab trap wrapped around the anchor chain. 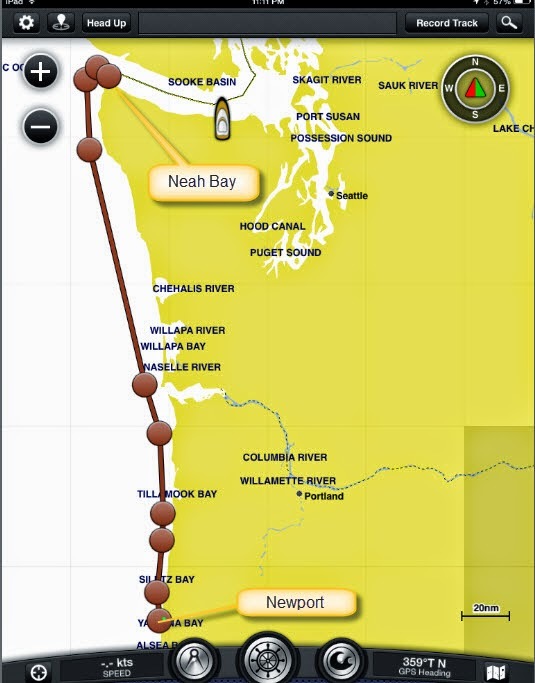 We moved out of the marina and into Neah Bay for the evening, always preferring to be on the hook when available. After cutting the lines the trap came off the anchor with just a boat hook and a little persuasion . Got lucky this time. Bad habits for Keela continue, Magnum bars are her favorite, only after one of us removes the chocolate of course.